Vitamin D (cholecalciferol) is a recognised clinical chemical determinant associated with osteoporosis and osteopenia (reduction in bone density). It also plays a role in the body's immune response, cardiovascular diseases and some types of cancer. Therefore, vitamin D is highly important from a number of diagnostic perspectives. 25-OH-vitamin D3 is the primary metabolite in the human body and the direct precursor of the physiologically active form 1.25-(OH)2-vitamin D3. First-line treatment for vitamin D deficiency is nutritional supplements with vitamin D3 or vitamin D2. Vitamin D2 is easier to synthesise and is widely used as a supplement outside of the EU, and especially in the United States. Therefore, its determination in serum/plasma is also relevant. 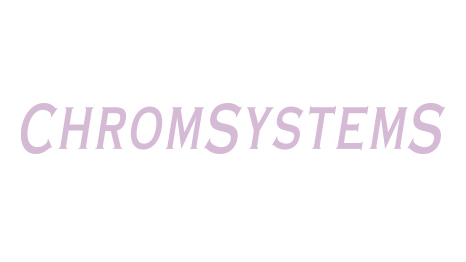 This Chromsystems kit allows the simultaneous and reliable chromatographic determination of 25-OH-Vitamin D3 and 25-OH-Vitamin D2 on an isocratic HPLC system with UV detection. By means of efficient protein precipitation and selective solid phase extraction interfering components are removed. A non-physiological derivative of vitamin D is used as a stable internal standard to produce reliable quantification. This way, reproducible and reliable results can be produced at a low expenditure of cost and time. 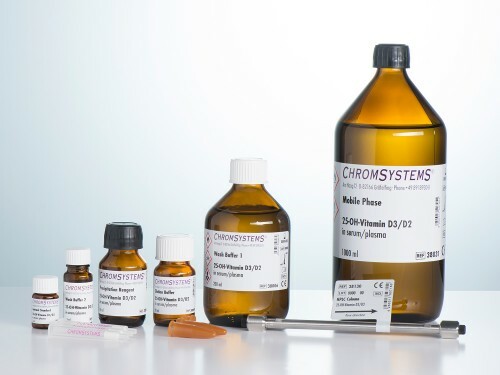 Alternatively, for high sample throughput Chromsystems offers an online method with selective online solid phase extraction (order no. 38900/1000) as well as methods for analysis using mass spectrometry (order no. 62000). Mix 500 µl serum/plasma with 50 µl Internal Standard in a light-protected reaction vial. Add 500 µl Precipitation Reagent, vortex-mix for 20 s.
Cool down 10 min to +4 °C. Centrifuge 5 min at 13 000 rpm. Apply complete supernatant to the extraction column and draw through by centrifugation or suction, discard effluent. Draw 2 x 1 ml Wash Buffer 1 through the column by centrifugation or suction, discard effluents. Draw 75 µl Wash Buffer 2 through column by centrifugation or suction, discard effluent. Elute 25-OH-Vitamin D3 and D2 with 200 µl Elution Buffer and dilute with 20 µl dist. water. Inject 25 µl eluate into the HPLC system. At ambient temperature up to 3 days, at +2 to +8 °C up to 1 week. It is recommended to keep samples cool for transport. Freeze for longer storage (up to 1 year) at -20 °C. Isocratic HPLC system with UV detector.